Ideal for Family use. 4 Bed rooms with attached Bathrooms , hot/cold Showers. Sleeps 8 with provision to increase to 14 with additional beds Consists of Open Rustic Verandah, Sitting & Dining section,Equipped Pantry, Bird watch Balcony, Garden Sit out , Free Drivers quarters and parking for vehicles within premises. Large Garden close to nature adjacent to lake and in tranquil surroundings. Pantry at the disposal of Guests. Self Catering though meals available with prior Notice. Preparation of meals free of charge by Bungalow Staff. Refrigerator / BBQ facility available. Habarana Town with Super Markets,Food Outlets,Groceries, Hospital ,Post Office & Communication Centres ,Police ,Bus and Railway Terminals, Elephant & Jeep Safaris . 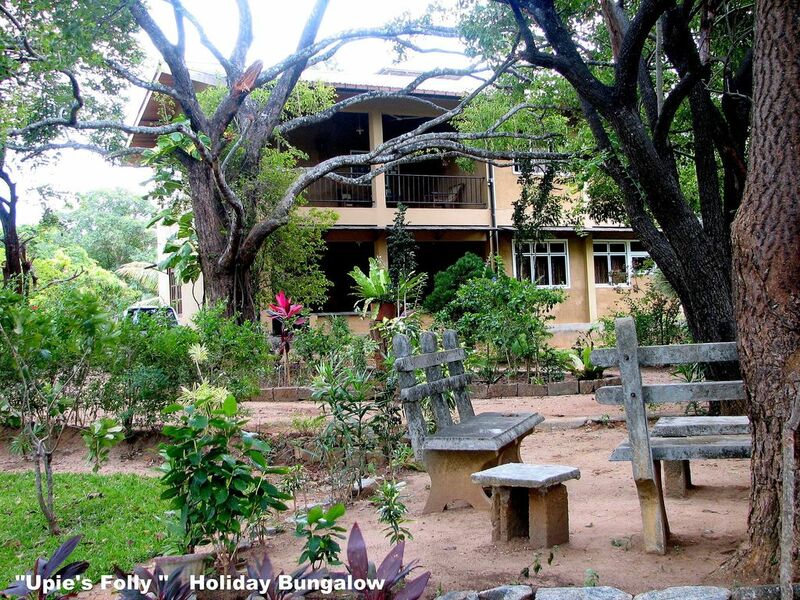 3 Wild Life National parks all within 15 minutes reach from Bungalow. Retired Bank Executive now Managing Upie's Folly Holiday Bungalow at Habarana. Resides in the city of Dehiwela .Interested in Tourism , Rugby Cricket , Camping & Wild Life. Large garden in tranquil surroundings adjacent to lake with privacy assured .Close to Nature with plenty of Bird Life. Centrally situated to many places of Tourist interest which can be covered by day trips.To name a few , Sandy Beaches of Trincomalee, Pink Quartz mountain at Namal Uyana,Historical & cultural cities of Anuradhapura, Sigiriya ,Dambulla, Polonnaruwa,Hermitage of Ritigala . Three Wild life National Parks within 15 minutes reach. Sunny weather most part of the year. Additional Tables and chairs can be provided within the same area or elsewhere with Guests preferance .